Do you know which region in India is almost missing from CSR action? NOTE- Size of the bubble is indicative of the quantum of money. As is evident, the Western region followed by the Northern, are the big generators of CSR funds. On the other side, the Western region followed by the Southern region are the major recipients of CSR money. The visual has two key attributes- nodes and links. Each node represents one of the six regions in India (“All India” includes all CSR projects that are not region-specific and are identified by the companies as “All India”). The colour of the node represents the region and the size represents the total CSR activity within that region i.e. CSR amount generated and spent. The arrow head depicts the direction of movement of CSR funds between regions. Please note that arrows appear only if the fund is above INR 10 Cr. 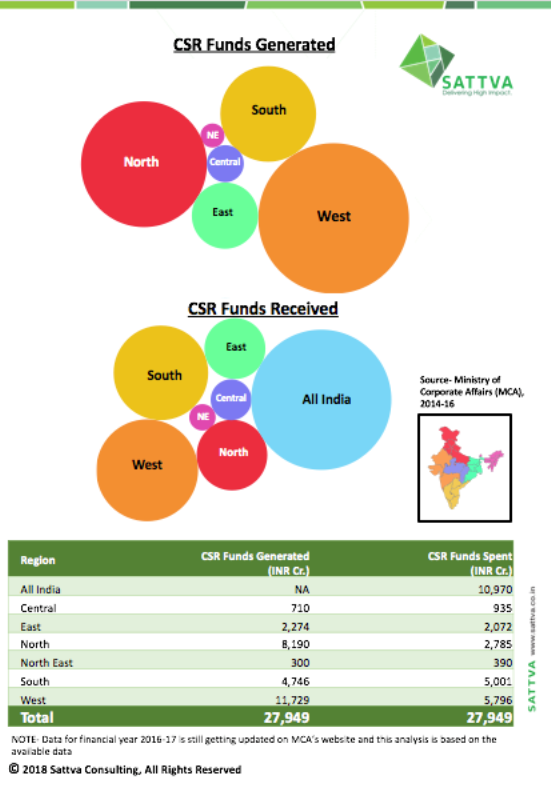 The width and the colour of the arrow depicts the magnitude of CSR fund flow between regions. The wider and lighter the link, the higher the amount of CSR funds flowing between the regions and vice versa. This chart is also available here as an interactive visual (please click to follow the link). One of our key insights from this analysis has been on under-representation of the North-East in the entire CSR landscape. So, are the CSR funds flowing in the right direction or not? An updated report that drills down the region-wise distribution of CSR is available here. Meanwhile, do write to us at impact@sattva.co.in with your thoughts, and help us take this analysis to more stakeholders by sharing the link and our social media posts with your network.